When it comes to media coverage, journalists typically only have so many words to work with and are often limited by the amount of space they have to tell their story. With such tight parameters, media outlets have to be extremely picky about what stories they pick up and are constantly having to justify why they went with one story over another. As PR professionals we’re constantly tasked with coming up with innovative ways to sell our clients to the media. By pushing the envelope in how we market our clients we’ve opened ourselves up to new ways to reach and interact with our audiences. While exploring the frontier of marketing is great, in doing so, we’ve also overlooked one of the most basic of human touch points: the value of first-hand experiences. 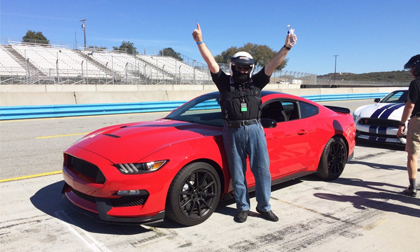 Recently Ford Motor Company offered journalists a chance to drive the all-new Shelby GT350. Ford didn’t use flashy social media campaigns or media gimmicks to get journalists behind the driver’s seat of their new performance pony… they didn’t need to. For journalists it wasn’t about the media angle or pitch, it was about the actual experience of getting to drive this legendary car on some of the most historic tracks in the U.S.
By giving journalists the opportunity to drive the Shelby GT350, the media was able to connect with Ford’s performance car on a completely different level. Having driven the vehicle, journalists could speak to the Shelby GT350’s capabilities from a personal perspective. If nothing else, the anticipation, takeaways and unique experience alone, generated buzz about the Shelby GT350 and positioned Ford firmly at the top of the automotive pack. Media coverage is the bread and butter of public relations and it’s what keeps the industry going. In Ford’s case, by putting seats in seats, they were able to offer a unique experience to journalists that generated enthusiasm about the Shelby GT350. Sometimes it’s useful to take a step back and look at the whole picture. While being innovative and thinking outside the box can set you apart from your competitors, going back to the basics and connecting with your audiences on the most basic of levels can sometimes achieve greater results.